Hello there and welcome to our big inspirational finale! 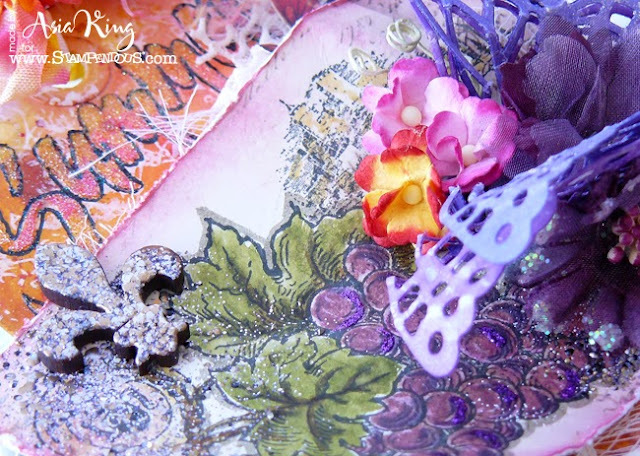 Are you enjoying our Dreamy Stampendoulicious inspiration week so far? Personally, I'm lovin' it! I've been drooling over all the beautiful projects prepared by both teams - be sure to check them all out, if you haven't yet. 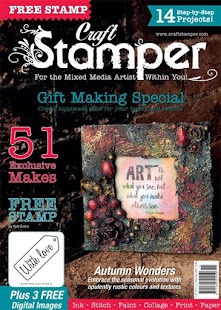 Just hop over to the Stampendous blog and follow the links for each day. And if you leave some love along the way you'll get a chance to win some great prizes (NB. you need a US shipping address to be able to win). What could you win? Two prize packages will be given away for the comments left on posts Monday-Thursday, July 29th - August 1st, and one prize will be given away for comments left on the hop day, Friday, August 2nd (today - YAY!). Winners will be selected randomly and announced Thursday, August 8th. 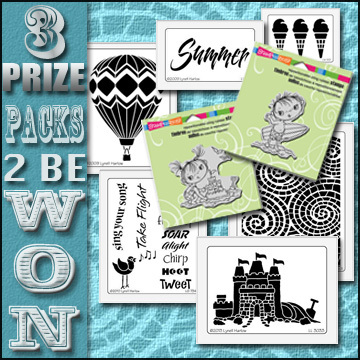 Prize package includes: Stampendous Surfer and Sandcastle Kiddos, Dreamweaver Hot Air Balloon, Ice Cream Cones, Summer, Mosaic Swirls, Bird Words, and Sandcastle stencils. 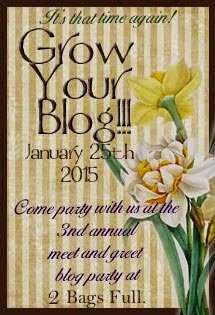 So here's what I prepared for our Big Blog Hop Finale - a juicy Summer sizzler :). And here are the steps. To have a closer look at the supplies I used, just click on the product icons at the bottom of the post. 1. 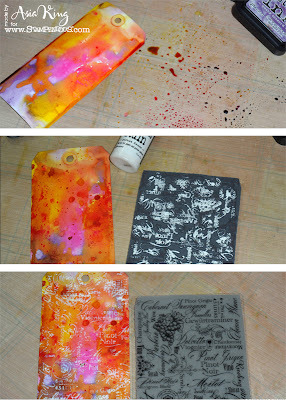 Ink up a tag with your chosen distress inks using wrinkle free distress technique. 2. Ink up the Wine Labels background stamp with Picket Fence (white) Distress Stain. 3. Stamp directly onto the tag. 4. 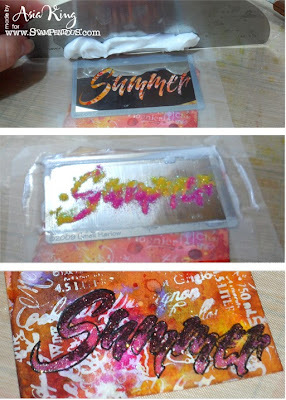 Spread Translucent Embossing Paste over the 'Summer' stencil. 5. Sprinkle the Micro Glitters over the wet paste. 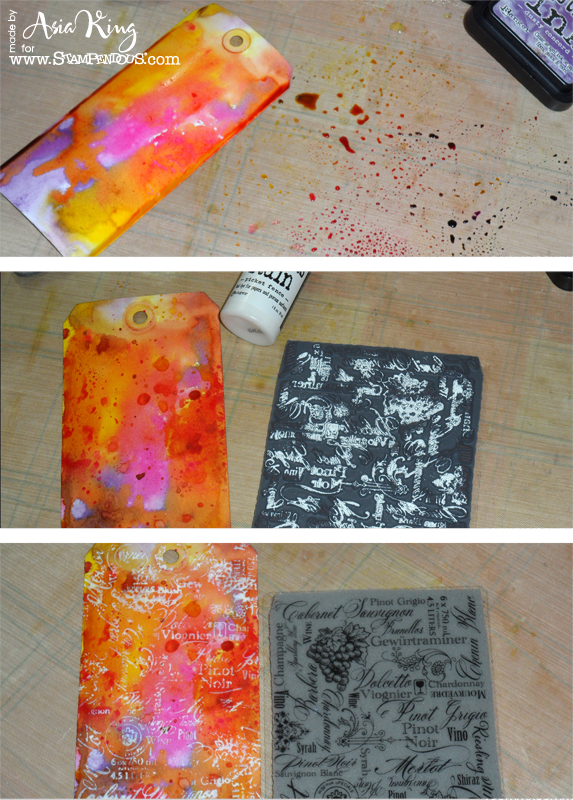 Carefully remove the stencil and allow to dry. Repeat the stencilling process in other areas of the tag. 6. Outline the glittered letters with a black pen. 7. 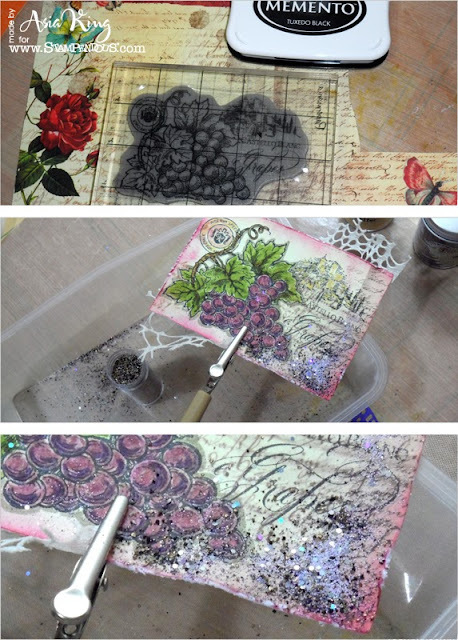 Stamp the Grape Label onto patterned paper. Colour with your favourite medium (I used Distress Markers). Trim the image and distress the edges. 8. Embellish the corners using encrusted jewel technique and your favourite Encrusted Jewel Kit. I used the lush Purple one :). 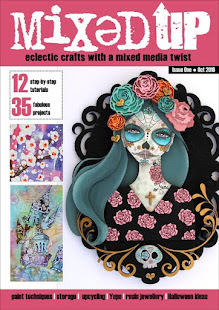 Add various embellishments, die cuts (I'm using Marianne's Design butterfly die) and flowers to complete your project. Did you enjoy this juicy summer sizzler from me? If the answer is 'yes' then why don't you click the 'follow' button below (or above lol) so you don't miss future inspiration from my Creative Spell! Have beautiful weekend and thank you so much for your lovely comments! Wow! This is beyond beautiful! The colors, the flowers, the textures..I am just in awe! Incredible Joanna! The details o. This are amazing, so beautiful! Thanks for a fun week! Sorry about missing your link, I will get it added. OMG!!!! Absolutely gorgeous and stunning!!! Beaytiful! I am getting so inspired- thanks for sharing!! Wow a lot of techniques, you really know what you are doing. I love butterflies!!! STUNNING project Asia...love all those layers! bursting with colour and vibrance, love it. 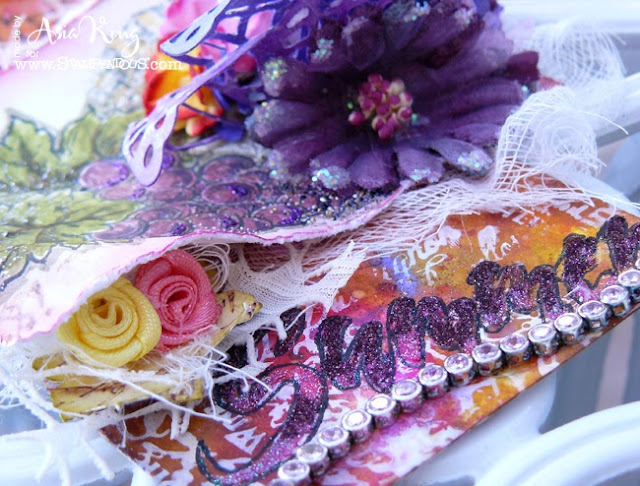 Terrific use of stencils, glitter and a tag. Thanks. Absolutely breathtaking! I could sit and look at this for hours and still find new details to drool over! Love the bright and vibrant colors! Thanks for sharing this gorgeous creation with me! It is great eye candy! wow, lots of layers, dimention and depth. this is just so stunning. oooh--love all the colors and special details. I love several things about your card. 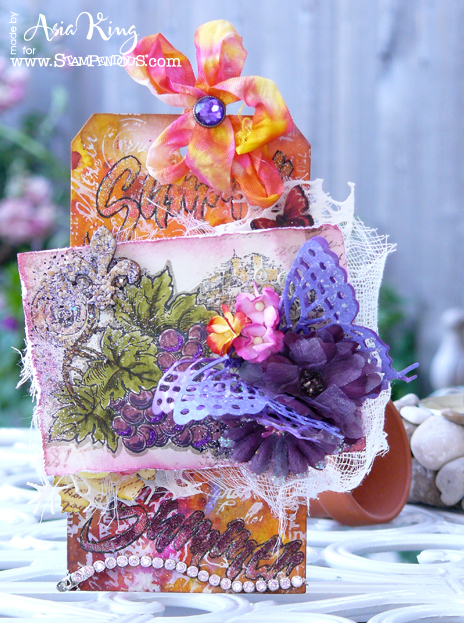 I love the way you outlined the word "summer" after it was embossed, I love the 3-D effect of your butterfly, and I love the grapes stamped on decorator paper. Colors are lovely too. Wonderful creation! Are you kidding me Asia? This is absolutely gorgeous!!!! I want to go back and keep looking at your photo! 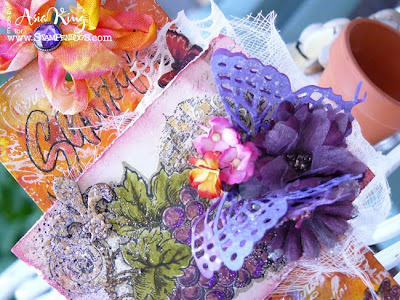 What glorious colours and dimension - love the contrasting oranges and purples - simply fabulous... I love your glittery wording too, and the beautiful, delicate cheesecloth. Thanks so much for playing along with us at Our Creative Corner. a fabulous confection of colour and technique Joanna - just glorious! So much detail and texture! Could study it for hours and not see everything! Thanks so much for playing along with the DW team this week! This is a wonderfully colorful piece! Collage is tricky and you have made it appear effortless. Thank you for designing with Dreamweaver this week hope we can do it again. This was like a summer explosion of color and beauty! I loved it! It always makes me smile to see a fellow friend of COLOR! You did an amazing job on this. 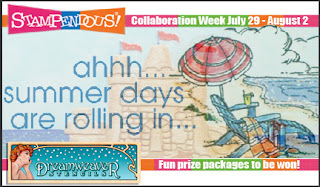 Thanks for sharing your talents with us at the Simon Says Stamp Monday Challenge blog! Wow, your tag has many layers in all senses..LOoks lovely and the MD butterfly die fits perfect onto the tag. Great project! Thank you for the steps! Wow that is incredible!! I'm actually kind of speechless. LOL! 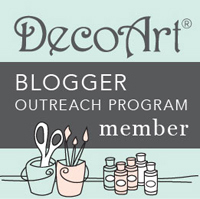 So happy to have you join our "Warm/Cool Colors" challenge and hope to see you play again! Oh wow! You managed to do something I would never have thought about and it turned out soooo stunning! Love how you combined both warm and cool colors :) Your project is amazing and so many gorge details too!